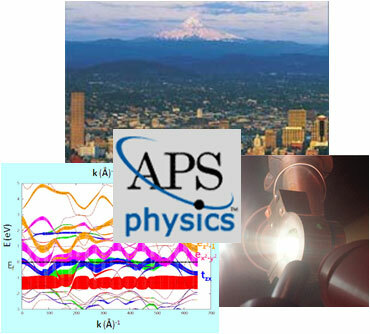 The annual March meeting of the American Physical Society was held in Portland, Oregon from March 15-19, with CDAC researchers well represented among a number of sessions. Seven of the CDAC academic partner groups, along with Carnegie personnel, National Laboratory Partners and HPCAT/HPSynC staff presented 46 papers in 20 different sessions throughout the course of the meeting. Of particular interest was a series of four high pressure research focus sessions, in which the work of a wide cross-section of the CDAC community was included. Of the 45 presentations in these special focus sessions, 20 of them contained a CDAC component in the results. The scientific and technique development work of CDAC Academic Partner Yogsh Vohra's group (Alabama-Birmingham) was featured twice in the focus sessions, and the group of new Academic Partner David Cahill (Illinois) also gave several presentations. CDAC Scientists from Carnegie presented 9 talks. Maddury Somayazulu and Tim Strobel discussed their experimental work on the high-presure behavior of the Xe-H2 and SiH4-H2 systems, respectively. On the theoretical side, J. G. O. Ojwang and Luke Shulenburger presented new results on transition metal oxides and P. Ganesh gave a talk on first-principles studies on ferroelectric materials. Also representing Carnegie was Angela Schad, a 2009 Carnegie Summer Scholar from the University of Notre Dame, who presented her theoretical work on Raman spectra of ferroelectric oxides. CDAC Laboratory Partners Dana Dattlebaum (LANL), Will Evans (LLNL) and Dan Dolan (Sandia) also also presented work from their respective high pressure groups. Dattlebaum spoke about the pressure-induced decomposition of hydrogen peroxide, while Dolan presented work on the P-T phase diagram of tin as determined from dynamic isentropic compression experiments. Evans was a co-author on four talks, and also chaired an important session that promoted new research and employment opportunities at the National Labs.